These and other awe-inspiring fantasy and science-fantasy stories await in The Best of Beneath Ceaseless Skies Online Magazine, Year Four, a new anthology of eighteen stories from Beneath Ceaseless Skies Online Magazine. 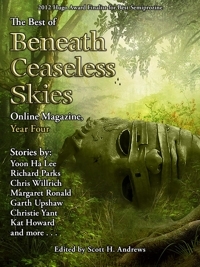 The Best of BCS, Year Four features such authors as Richard Parks, Yoon Ha Lee, Margaret Ronald, Garth Upshaw, Kat Howard, Christie Yant, and Chris Willrich. It includes “The Governess and the Lobster” by Margaret Ronald, named to Year’s Best SF&F 2013 edited by Rich Horton; “Sinking Among Lilies” by Cory Skerry, named to Year’s Best Dark Fantasy & Horror 2013 edited by Paula Guran; and “The Castle That Jack Built” by Emily Gilman, named to Year’s Best SF&F 2013 and a finalist for the 2013 World Fantasy Award. The Best of Beneath Ceaseless Skies Online Magazine, Year Four is available for only $3.99 from major ebook retailers in different ebook formats, including Kindle, Kindle apps, Barnes & Noble, and iPhone/iPod Touch/iPad, and more. Read it on your e-reader, smartphone, laptop, or tablet. All proceeds from the sale of The Best of BCS, Year Four go to pay BCS authors and artists for their work. Buy a copy to read great literary adventure fantasy and support Beneath Ceaseless Skies.